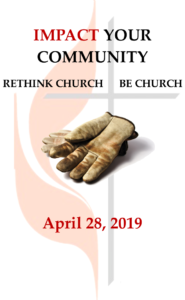 Sunday, April 28, Santee UMC will have ONE worship service at 8:30 AM, followed at 10 AM with IMPACT Sunday, an opportunity to serve with other Methodists as a form of worship. Join in a community-building day of service with a variety of activities on and off campus, in coordination with Foothills United Methodist Church. There will be opportunities for low-mobility volunteers as well as families with kids. Following our projects, we are invited to gather for lunch at Foothills UMC in La Mesa from 12 – 1:30 PM. (RSVP for lunch here). CLICK HERE to indicate which of the projects you want to participate in.